WHEN SHOULD WE START TOILET TRAINING? HOW CAN I HELP PREPARE MY CHILD FOR POTTY TRAINING? IS IT WORTH SPENDING LOTS OF MONEY ON A DERMAL THERMOMETER? This was amazing!! It was also expensive but totally worth taking Miss 2 for a rare treat after yet another hospital appointment. Raw HQ is run by a lovely mum & nutritionist and stocks a range of allergy friendly / vegan / paleo foods. Want to have a go making something like this at home? There are lots of recipes online (though none with exactly the same ingredients as this delicious treat), here is a sampling of them; remember that you can use the base from one, the filling from another etc. to make your own favourite recipe! Better Food Fair – check out these great products for wellness & healthy living! Amazing cakes from The Raw Kitchen! Vegan, paleo, and gluten free. I had an amazing time today at the Better Food Fair and Go Green Expo thanks to some promo tickets. Check out the slideshow for some of the awesome products! Purebread have some great gluten-free products (including bread that is also soy free!). Enter discount code nopesticides to get $3 off every loaf, buns, pizza packs, & flatbreads. Lalele Organic is a mobile food shop with beautiful organic popsicles. They had a huge range of gourmet flavours; like: Orange & Cardamom, Feijoa Sorbet, Mango & Coconut & Masala Chai. Raw Kitchen have amazingly delicious raw foods (their cakes are fabulous!). It’s a wonderful treat if you have food allergies! They’re online, have a cafe in Auckland (NZ), and have also published a beautiful recipe book. Storm & India have beautiful bespoke organic teas. I’m drinking their Vintage Chai while I type! All Natural Mums have an exciting range of kids products like pretty play make-up sets, hair chalk, and edible, organic nail polish. Dr Martha Nessler was lovely to meet and chat with about doTERRA essential oils. NuFoods have a yummy nut butters; I liked the Almond & Coconut best. Munch Cupboard have some great products, like reusable sandwich bags. Angel Foods are bring a vegan, dairy and soy free, cheese to New Zealand. Cheeses like Daiya are apparently cheap in the USA but shockingly expensive in New Zealand so it’s great to see an addition to the market. Be Nourished have a range of fermented products, like Sauerkraut and Kimchi, to promote inner gut health. Pure Coco have a range of natural products including allergy friendly chocolate! Love Skin have beautiful botannical hand blended oils for a touch of luxury. Some people search for a replacement for soy sauce for health reasons (such as reducing salt or going paleo) and for others it’s because of food allergies (like gluten or soy). I was really excited while researching alternatives to discover coconut amino acids. Coconut aminos are a liquid made from the aged sap of coconut blossoms and salt. It is a low-glycemic, vegan, and gluten-free alternative to soy sauce, with 17 amino acids. Coconut aminos have about 65% less sodium than regular soy sauce but still has a rich, sweet-savory flavour. They can be picked up from health food stores, organic stores (like Huckleberry) and some supermarkets. The brand that was recommended to me was Coco Not Soy Sauce and I used it to make a fabulous Teriyaki Sauce that Miss 2 loved. I had the pleasure this summer of talking with Hayley, the awesome graphic designer at Little Red Inspired, who has a fantastic range of t-shirts for kids with allergies. As well as ordering from her direct they can also be purchased from Willow Boutique; personally I think the flying cow for the dairy-free t-shirt is super cute! As well as having a range of ready made t-shirts, Hayley can also customise them for only a couple of dollars more. Once I’d settled on a general design and wording that I liked, she mocked up 3 different designs for me to choose from – what great service! She also does stick-on washable labels for lunchboxes which is super handy! I don’t know about your kids but my Miss 2 is as spirited and headstrong as she is lovely and loving. She does not like thermometers. Even in her sleep she will fight and push me away rather than having a digital thermometer stuck in her armpit and I can forget trying to take her thermometer orally. I’ve become rather adept at estimating her temperature (with surprising accuracy) but it’s maddening when it’s diagnostically useful to know if her temperature is elevated. I decided that the solution was to try and buy a dermal thermometer like the doctor’s have. There seem to be two types of these, ones that go in the ear (and often require ongoing purchase of disposable covers) and ones that can read from the forehead. The other issue with an aural (ear) thermometer is that its reading can be impacted if there’s a build-up of wax (so not necessarily that useful if they’re prone to frequent ear infections). A brand name dermal thermometer like Braun can potentially cost USD$60 (NZD$90-150). I went searching online for reviews of several brands and the recurrent problem was that some people would be delighted and others would find that it just didn’t seem to be accurate. It seemed like a lot of money (on a very limited budget) to gamble on something that might not work so instead I decided to make a slightly riskier (but definitely cheaper) gamble on buying a generic one straight from China. I have seen these listed by various online retailers and trading sites for anywhere for USD$30 (Amazon) and NZD$30 (TradeMe). Buying it direct from AliExpress cost USD$10 and included free international shipping. Ther are heaps of vendors on AliExpress so take the time to check quantities of sale and their feedback. Mine showed up very quickly and so far seems to be giving the same reading as the digital thermometer so I guess it’s working fine. I found a big selection of vegetarian Indian meals at a bulk buy store recently which we can actually eat because they use rice bran oil and they declare every single damn ingredient that they use (for which I love Priya as only someone with food allergies in the family can). The idea of a shortcut in the kitchen or a kinda-almost-sorta takeaway was wildly appealing so I decided to give them a try. We’ve already tried their Shahi Paneer. Avial is a “popular south Indian dish with select combination of cooked vegetables, coconut gravy, and choice of spice blend.” The vegetables are apparently potato, radish, ash gourd, snake gourd, carrot, yam, beans, onion, and chilli. The oil is declared as coconut oil and the ingredients appear to be soy free. Although the curry is primarily coconut based, it does contain curd so is not suitable for dairy free. It was pleasant and mild although not the most appealing visually (and definitely didn’t look like the photo on the packaging!). Allergies: soy free, egg free, peanut free, gluten free. Not suitable for dairy or tree nut (cashew). I’ve been working my way through the Yes You Can range of allergy friendly baking mixes. So far we’ve tried Cinnamon Apple muffins and Chocolate Orange Zest cake, their Buckwheat Pancakes, their Brazilian Cheese Bread (Pao de Queijo) – marketed as a Savoury Snack Mix, and now their Super Grain Cookies. They are soy free, gluten free, dairy free, egg free, peanut free, tree nut free. They even rate an impressive 3.5 stars health rating (which is pretty good for cookies!). Mine aren’t the most even in thickness because I rolled them into balls and Miss 2 flattened them into cookies. Being busy with her also meant I took them out of the oven a few minutes later then I would have liked so they’d definitely set to crunchy biscuit (rather than soft and chewy). I think the mix probably is intended anyway to have an anzac cookie type texture. In terms of flavour, these are pretty mild. Hints of apple, cinnamon, and vanilla are what they’re aiming. Making them again I might add some extra spices (i.e. ginger and a little extra cinnamon, or a bit of golden syrup). Our quest for allergy friendly foods (on a very limited budget) has me exploring all kinds of things in the kitchen. I love living in a city with so many cultures and so many types of food and love cooking widely. I like exposing my toddler to a range of foods and trying to encourage a wide palate (besides she doesn’t like my mac’n’cheese anyway). I’ve never been a big fan of Indian food (apart from some truly delicious foods that Indian friends have cooked at home themselves) as I find the spice base, even when mild, often leaves me feeling ill. I find this in equal parts frustrating and amusing given that I have eaten some truly hot dishes in Thailand and Vietnam and been fine. I found a big selection of vegetarian Indian meals at a bulk buy store recently which we can actually eat because they use rice bran oil and they declare every single damn ingredient that they use (for which I love Priya as only someone with food allergies in the family can). The idea of a shortcut in the kitchen or a kinda-almost-sorta takeaway was wildly appealing so I decided to give them a try. The first one was Shahi Paneer; “a highly rich north Indian curry of cottage cheese cooked in a cashew gravy”. Paneer is a kind of cheese (you can even make it yourself) and in this case is in a mild cashew gravy. I was cooking quickly for Miss 2 so ended up making egg noodles and ending up with some quasi-hybrid-cultural dish that nonetheless tasted good. I liked it and Miss 2 consented to try it and eat a small portion (which is reasonably high praise from a toddler confronted by something new). Allergies: soy free, gluten free, egg free, peanut free. I did a post a while back about Yes you can allergy friendly baking mixes. 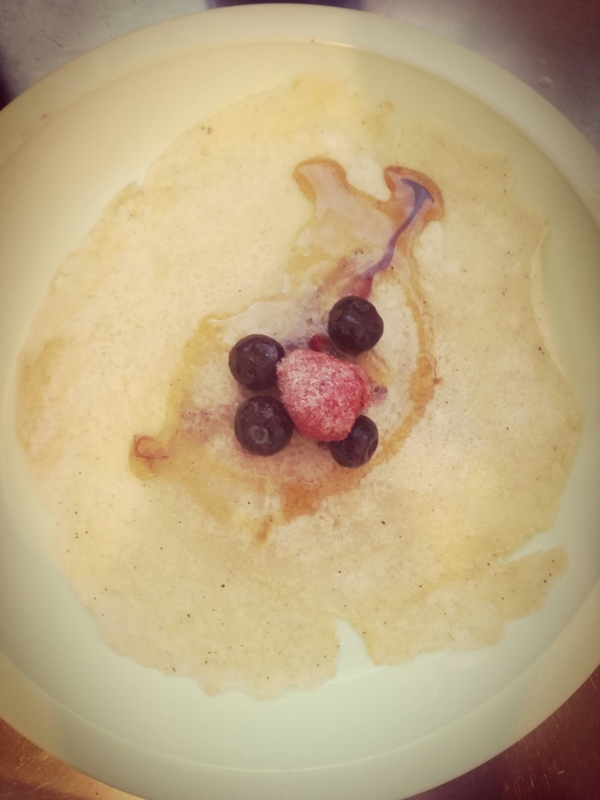 We’d tried their Cinnamon Apple muffins and Chocolate Orange Zest cake, now we’ve tried their Buckwheat Pancakes. Allergies: soy, dairy, gluten, egg, peanut, and tree nut free. They’re really easy to make (just add water and shake to make up the mix) and are already sweetened so don’t need too much in the way of toppings. Both Miss 2 and I approved. We used whipped cream and frozen berries; they would also be great with freshly sliced banana and honey.